I am so happy to be here to help out Emily while she spends lots of cuddle time with her sweet new baby. I have 3 little kids myself, and I still remember the sheer exhaustion and lack of energy I had with a newborn at home. The last thing on my mind was dinner. I was so grateful for all my friends who brought meals over to my home. That’s why I am so excited to be here today because, virtually, I can bring Emily a meal! I wanted to keep it simple and I wanted share something with you all that my family cant get enough of! 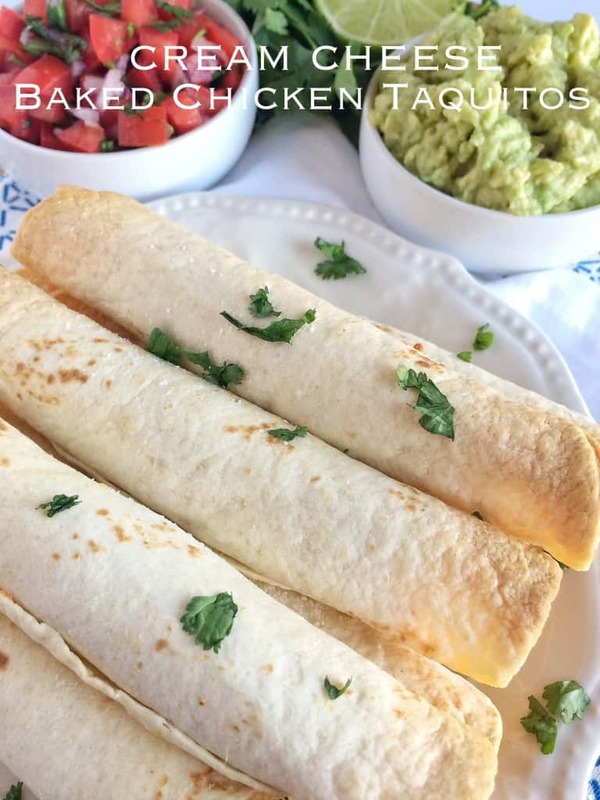 These baked cream cheese chicken taquitos contain simple ingredients and it makes a ton so it’s perfect to leave in the fridge and eat as leftovers for the next couple of days. You may think the flour tortilla would get soggy, but they don’t! It won’t be as crispy as it was fresh, but it still has that semi-crunchy exterior that we all love about taquitos! Even after being in the fridge for a day or two. I also love that these cream cheese taquitos are baked and not fried. The trick to getting these super crispy is to spray the rolled up taquitos with cooking spray before baking them. Don’t skimp on the cooking spray either. Obviously, you don’t want to soak the poor things, but make sure you give them a nice coating of cooking spray. Place your fresh (I think fresh cook better) boneless, skinless chicken breasts in the bottom of the slow cooker ( I like to clean mine first. It sounds weird, but I’m picky about my meat so I want all the fat gone and all the tendon-y type parts). Pour a standard size (14.5 oz) can of chicken broth over it. I would not recommend using low-sodium because you need the extra salt & flavor to withstand the longer cooking time. The key is to make sure most of the chicken is covered in the broth so that it does not dry out. We want moist and tender chicken! Cook on low for 4-6 hours and then shred the chicken. Use in any recipe that calls for shredded chicken, like these baked cream cheese chicken taquitos. We love these served with some simple guacamole; mash up 2 avocados, add a small squeeze of lime juice (like 1/2 a lime) and a pinch of kosher salt. Simple, but oh so delicious! I also make a simple pico de gallo to go with these; chop 4 roma tomatoes, add chopped red onion & cilantro to your liking, squeeze of lime juice (the other 1/2 of lime) and a pinch of kosher salt. If you really want to get fancy then make this Tomatillo Cilantro & Lime Ranch Dressing. This stuff is so good you’ll basically want to drink it 🙂 Not that I know by experience or anything…..
Heat oven to 425 degrees. Line a cookie sheet with tin foil. Set aside. Combine the shredded chicken, cream cheese, shredded cheese, and all the spices in a mixing bowl. Mix together well. Warm up the tortillas (you will want to warm up the corn tortillas a few at a time so they don't tear) in the microwave for about 30 seconds. Place 2 tablespoons of filling onto each tortilla and roll up tightly. Place seam side down on the cookie sheet. Repeat with remaining tortillas and filling. Spray the taquitos with cooking spray and then sprinkle with kosher salt. Cook for 18-20 minutes or until the taquitos are golden brown. *recipe note: You can use either flour or corn tortillas, we like them both. The flour tortillas tend to get crispier so we prefer the flour tortillas. To help make the blending of the ingredients easier, microwave the cream cheese for 15-20 seconds or until it's very soft. It will make mixing everything together easier. Thanks so much for having me today. Be sure and come visit me at Together as Family. I’d love to have all of you! You can also connect with me on Facebook, Pinterest, or Instagram! Can’t wait to see you!